London Palestine Action, a Palestinian solidarity network based in London that thrives on creative action against Israeli apartheid, particularly through the usage of BDS campaigns, has organized a peaceful protest to be held on the 6th of July, 2015 at the Elbit factory in Shenstone near Birmingham. 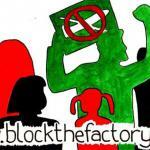 The protest will transform the area surrounding the arms factory into an inventive space tailored to children. The intention revolves around servicing the needs of the people, rather than succumbing to the needs of Israeli corporations that rely on profiting off of Palestinian death. Activists occupying Elbit's factory in Shenstone are expected to cost Elbit over $150,000 by halting their operations. It will be held on the one year anniversary of Israel's summer assault on Gaza which killed the innocent lives of over 2,200 Palestinians and furthered the horror that has resulted from Israel's colonization of historic Palestine. The bloodbath was executed through the use of Hermes 450 drones manufactured by UAV Engines Limited factory in Shenstone, owned by Elbit Systems. The UK government has not only taken no action against Elbit Systems, but has also made no effort to make Israel accountable for its unceasing crimes. Since 2010, over $76m worth of arms to Israel has been authorized by the UK, including over $10m leading up to the Gazan massacre last summer. Essentially, the government has engaged in profiting off of not only the destruction and death of innocent lives, but the intentional "field testing" of drones designed to ethnically cleanse an entire populace. Last summer, nine members of the London Palestine Action network occupied the roof of the same factory resulting in the loss of $285,000 worth of profit, effectively closing it for two days. The activists who were arrested plead not guilty in order to expose the illegal manufacturing of units exported to Israel to be used during attacks on Palestinian civilians. Not surprisingly, the case was dropped hours before the UK government and Elbit Systems were required to provide documented details of its arms trade with Israel. The London Palestine Action network and its organizers are asking for people to respond either by visiting the Facebook event page or via BlockTheFactory.org.